We are currently updating our webpage & will complete it soon. Contact us at kim@tremaine.us or call (916) 637-9717 with your suggestions & comments. TREMAINE, a woman-owned business, was established in 1994 and is headquartered in West Sacramento, California. Our services include all aspects of conventional cultural resources management: feasibility studies, management plans, archaeological reconnaissance, site testing, mitigation, and monitoring. By integrating a geophysics component, we also offer our clients effective, creative strategies for practical and regulatory challenges. Our work is well researched, objective, and intended to advance projects with timely solutions. Our core professional staff includes environmental planners, archaeologists, geophysicists, geologists, and GIS specialists, as well as field and laboratory supervisors & directors. Our accounting system uses SAP's Business One® to administer account payable & receivables, estimates & billing. Our 18 years of experience means that we can meet the scope & scale of any project & can provide the skills & field personnel necessary to complete any project, anywhere in the world. Our stature and business longevity means that we've established broad strategic partnerships with civil engineering, environmental, archaeological, paleontological and geological sciences and specialists. We have successfully completed a wide range of projects, from small-scale, local land developments to highly complex and demanding programs in a variety of business sectors & markets including communications (fiber optics), product pipeline, capital developments, transportation, water resources, and military facilities. Our western states projects were located in all its major environments including the Pacific coast, Central Valley, Sierra Mountains, Southwestern deserts, and Franciscan & North Coast Ranges. With almost 1000 projects behind us, our senior officers are solid veterans of the resource management profession. Together we possess the complementary strengths of managerial excellence, regulatory knowledge & experience, academic scholarship, and technical proficiency needed for successful project development. There are two aspects of projects involving cultural resources management: (1) the legal aspect for compliance with both CEQA and NEPA; and (2) the heritage tourism aspect. Both will be addressed in the following sections. TREMAINE & ASSOCIATES has completed many Section 106 & CEQA projects, as well as hybrid projects across several federal, state & local agency jurisdictions. We prepare reports for Initial Studies, Environmental Impact Reports (EIR), Environmental Impact Statements (EIS), and their subsequent mitigation studies. 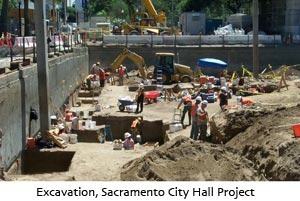 For these projects, we have conducted archival research, consulted with Native Americans and local historical societies, evaluated resources for eligibility to the California Register and NRHP, monitored during construction in sensitive areas, dealt with unanticipated discoveries, data recovery and Native American concerns. Our early efforts to gain the Office of Historic Preservation support for including the vertical Area-of-Potential-Effects (APE), taking into account development's impacts in all 3-dimensions. It is now necessary to demonstrate the subsurface presence or absence of cultural resources within an APE or Area of Direct-Impact (ADI). It supplements the value surface surveys by requiring subsurface sampling A discussion of the late quaternary geology of the region and likelihood of buried resources is now required. If the likelihood exists and vertical impacts are significant or substantial, a subsurface investigation may be necessary. This can be accomplished using non-invasive geophysics, augering, or backhoe trenching. The TREMAINE office and lab facility is a 10,600 square foot complex equipped with networked computer stations, and a research library with thousands of references. We maintain a large artifact processing and analysis area, and the necessary excavation equipment to meet the needs of many concurrent field operations. Our administrative support services include an automated project budget and payroll tracking that make project management transparent & well organized. TREMAINE also has a complete computer graphics, certified GIS and mapping department, with staff experienced in a wide variety of GIS software (e.g., ESRI ArcGIS, Spatial Analyst, 3D Analyst) for producing comprehensive maps and detailed geospatial analyses. Our firm has completed a wide range of cultural resource project types from a variety of geographic settings and temporal periods. Prehistoric work spans the last 10,000 years, including: habitation sites, burial grounds, sparse lithic scatters, baked clay scatters, bedrock milling stations, toolstone quarries, and seasonal encampments. Historic work spans the early 19th through early 20th century, ranging from contexts associated with mission life, mining, ranching, logging, transportation, as well as urban residential and commercial settings. We are also able to handle historic architectural work through our subconsultant, Carol Roland, Ph.D., of Roland-Nawi Associates. There are several important reasons for using geophysics methods. The most import of these is the need to find buried resources early in the environmental process, rather than later during construction. Cultural resources can be obscured by vegetation, pavement, or overburden, and therefore missed during conventional pedestrian survey. We offer a solution to this problem in an effort to avoid costly delays during construction, when unanticipated discoveries are often made. There are also advantages in using geophysics at the evaluation and data recovery phases of site management. TREMAINE employs a suite of geophysical instruments as listed below. TREMAINE uses Underground Survey Technology™. It is a mobile geophysical instrument for near-surface (upper 30 meters) geophysics investigations. It is a Difference Machine™. It detects differences in a soil that are due to differences in moisture content, compaction, materials, texture and chemistry. and detects and identifies various for three volumes (depths) simultaneously. The result in a tremendous increase in data, providing much more information & confidence about what lies below the surface. This information is useful for identifying buried cultural resources. However, it is also very useful within a number of decision making arenas of project development, particularly, design engineering, geotechnical, environmental, and ROW/utilities. By identifying potential problems during the planning and design phase, rather than down the road, the “unforeseen” is avoided, reducing design errors and omissions, schedule slippage, scope creep, and cost overruns. It can also be used as a fact-based audit of the project area's subsurface environment (part of a project constructability review). Our technology has enormous potential for payoffs, given that currently, over 50% of all construction claims and change orders are the result of insufficient subsurface information. TREMAINE to conduct surveys in a wide range of environments. The complementary nature of the resistivity data allows for more accurate models of the subsurface to be generated from the EM3 data, reducing the need for more expensive subsurface testing. 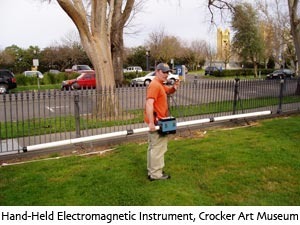 Ground penetrating radar is now a commonly used technique in geotechnical, engineering and ROW/utilities investigations for providing high resolution images of the buried strata and objects. The combined use of these different methods provides a powerful “toolbox” for cultural resource, environmental, geotechnical and ROW/utilities investigations. ￼ /em> Executive Order: Preserve America, signed by George W. Bush on March 3, 2003, calls for the “use of historic properties for heritage tourism and related economic development in a manner that contributes to the long-term preservation and productive use of those properties.” As defined in the Executive Order, Section 7, “heritage tourism” “means the business and practice of attracting and accommodating visitors to a place or area based especially on the unique or special aspects of the locale’s history, landscape, and culture.” Furthermore, the National Endowment for the Humanities has started a fairly new Initiative called We-the-People showcasing America's Historic Places … that is, those that embody our unique spirit, character and identity. The goals of the initiative include a greater shared knowledge about the Nation's past, strengthened regional identities and local pride, increased local participation in preserving the country's cultural and natural heritage assets, and support for the economic vitality of our communities. Archaeology has a charisma that other aspects of historic preservation sometimes lack. The process of discovery excites and interests many people who are otherwise indifferent to or even hostile to history and historic preservation. It is our strong contention that Sacramento’s history can be brought alive and contribute to a project’s overall success through interpretive displays and literature. TREMAINE brings experience in assessing prehistoric and historic resources sensitivity all over the state of California, as well as experience with testing, monitoring, and mitigation of such resources if needed. Please see our Experience page for deatails about TREMAINE'S past and current projects. Carol Roland, of Roland-Nawi Associates, is an historical resources firm with expertise in all aspects of cultural resource management including broad experience in historical survey and evaluation, extensive knowledge of American architecture and history, and familiarity with state, federal, and local preservation laws and regulations. Dr. Roland has over 18 years experience in all aspects of cultural resource management, historic preservation, and environmental analysis. Dr. Roland has worked with TREMAINE on numerous projects including the Globe Mills and Sutter projects in Sacramento.